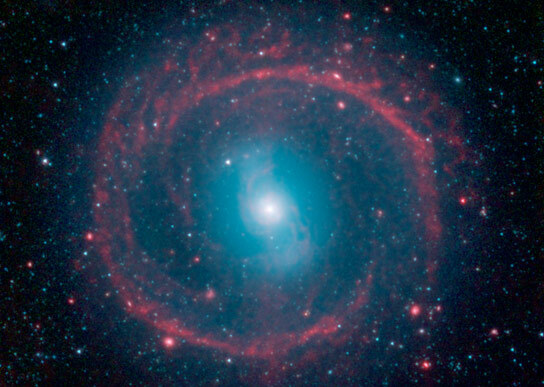 A newly released image from the Spitzer Space Telescope shows galaxy NGC 1291, which is located about 33 million light-years away in the constellation Eridanus. It might look like a spoked wheel or even a “Chakram” weapon wielded by warriors like “Xena,” from the fictional TV show, but this ringed galaxy is actually a vast place of stellar life. A newly released image from NASA’s Spitzer Space Telescope shows the galaxy NGC 1291. Though the galaxy is quite old, roughly 12 billion years, it is marked by an unusual ring where newborn stars are igniting. NGC 1291 is located about 33 million light-years away in the constellation Eridanus. It is what’s known as a barred galaxy, because its central region is dominated by a long bar of stars (in the new image, the bar is within the blue circle and looks like the letter “S”). The bar formed early in the history of the galaxy. It churns material around, forcing stars and gas from their original circular orbits into large, non-circular, radial orbits. This creates resonances — areas where gas is compressed and triggered to form new stars. Our own Milky Way galaxy has a bar, though not as prominent as the one in NGC 1291. Sheth and his colleagues are busy trying to better understand how bars of stars like these shape the destinies of galaxies. In a program called Spitzer Survey of Stellar Structure in Galaxies, or S4G, Sheth and his team of scientists are analyzing the structures of more than 3,000 galaxies in our local neighborhood. The farthest galaxy of the bunch lies about 120 million light-years away — practically a stone’s throw in comparison to the vastness of space. The astronomers are documenting structural features, including bars. They want to know how many of the local galaxies have bars, as well as the environmental conditions in a galaxy that might influence the formation and structure of bars. Over time, as the fuel runs out, the central regions become quiescent and star-formation activity shifts to the outskirts of a galaxy. There, spiral density waves and resonances induced by the central bar help convert gas to stars. The outer ring, seen here in red, is one such resonance area, where gas has been trapped and ignited into star-forming frenzy. Be the first to comment on "New Spitzer Image: Galactic Wheel of Life Shines in Infrared"